We are sitting in the small town of El Rosario taking yet another unplanned day off. Our progress since crossing the border has been a little slower than normal... broken shifters, upset stomachs, torrential downpours...and major heat have all conspired to make us enjoy this leg of the journey at a more leisurely pace. Hopefully we will get back on track tomorrow... But who knows what could be around the corner! We tried to get an early start, but we were not on the road until about 7:30. We rode about 20 or 25 km through suburbs of San Diego, passing a lot of car dealerships and big box stores. When we finally reached the border it was 8:30, we had done some research so we knew to cross with the pedestrians, not the vehicles (this is always a dilemma for the cyclist). We walked through and stopped where some armed guards were standing, even though most other people walked right past them, they asked us where we were going and made a very vague attempt to check our bags, then waved us on. We then squeezed through the turnstiles....and we were in Mexico... No passports checked, and it took about two minutes. But, we knew that we needed to get a tourist card... So we walked around for a few minutes and finally a man waved us back into the 'border area', we quickly got a tourist card for $24 each, and we were on our way. 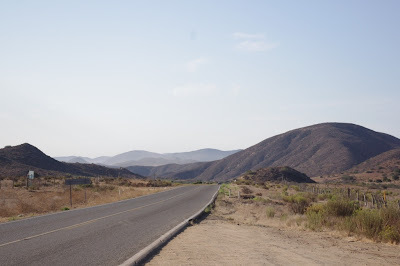 From what we understand getting into Mexico is very easy, it is the getting back to the USA that is difficult, some people told us that they waited up to five hours in a car to cross! Getting out of Tijuana and down the coast was a bit more of a challenge. There are two roads out, a free road and a toll road. Many cyclists we had read about took the toll road, even though cyclists are not technically allowed on it. They said that it had wide shoulders and not too much traffic... But the risk is that you would be asked to leave and would have to turn around and/or be asked to pay a fine. So, we opted for the free road, thought it might be more straight forward. However, it turns out the all of the signs leading you out of the city have you taking the toll road... It was a little confusing, but with the help of a decent map we were able to get on the free road. The road took us over a big hill and back to the coast which we followed until we reached our first stop in Mexico... Larry's place, he is a warm showers host with a beautiful home looking out over the ocean. So all in all it was a pretty smooth entry into the country, no gun wars to dodge...phew. We continued down the coast to the town of Ensenada, where a very kind man named Gerardo has set up a Casa del Ciclista. It is a little apartment that he owns, but does not live in, which he opens up for cyclists to stay at as long as they need. His neighbor, Delia welcomed us when we arrived and gave us the key to the apartment. It was a very welcome rest, and a good chance to get used to life in Mexico. We were also lucky that Ensenada has a good bike shop (TNT), and glenn was able to get a broken shifter replaced really quickly! Unfortunately... In Ensenada I started to feel effects eating some bad food or drinking some bad water... Hard to know which. But we stayed a second day which I spent the majority of sleeping. In the Casa is a very special bicycle, it belonged to a man named Valdo who was from Brazil. He was cycling around the world with a message of peace, check out a photo of his bike in the slideshow. After riding all the way from Brazil to the Baja he passed away from a heart attack in the desert. He had been planning to come and stay at the Casa, and apparently it was a dream of his to open a similar home in Brazil. His bike was brought to the Casa, and is still there. In the house there was also an amazing journal with notes for other cyclists, many doing a similar journey to ours....what an amazing place it was! Hot Days and really upset stomachs! We finally made our way out of Ensenada. Unfortunately, we did not get onto the road until about 8am, and we were headed inland - which meant up! The first two hours were OK, and not too hot, but then it got hotter and hotter and we were climbing and climbing. I was still feeling the effects of whatever I was sick with so this climb was extra painful. I had to stop every few hundred meters and hide under what bit of shade I could find. I considered crying, but thought it would take up too much energy and I couldn't afford to lose the fluids, so little by little we made it up that hill. At the top there was an incredible cold drink stand.... Miracle! We took a siesta under a prickly bush that afternoon and got back on the bikes at about four, it had cooled down and the wind had picked up (a tailwind! ), so we cruised for the last 30 km of the day into the town of San Vincente where we were able to find a cheap place to stay, get some food and crash. Unfortunately our blissful sleep was interrupted in the middle of the night by our erupting stomachs. Within minutes of eachother we both lost whatever had been in our stomachs. Somehow we got back to sleep. We both spent most of the next day in bed still recovering from food poisening, or something ? The next morning we were back on the bikes... By about 6:30 am this time to avoid the heat. Unfortunately by about 10 am Glenn was feeling really weak and incredibly tired. We found a place to stay, and glenn spent yet another day in bed with a low grade fever....man or man Mexico! The next two days we got up early early and rode reasonable distances, but Glenn was still feeling pretty weak....so hopefully by tomorrow we will be back on track....??? We woke this morning at five, as is our new normal, and the thunder and lightening seemed to waken with us. Just as it started to get light at six, we had our bikes packed and ready to go.... Then the rain started. We first thought that it would be like yesterday afternoon....but no, it was a little stronger and a little longer.... About three hours long in fact. The parking area had become a lake, the road a river, and small waterfalls were developing in the ceiling of or room. It was a very exciting morning. When it finally let up for good around 10 am the town was a mess. The roads were covered in mud and debris and everyone was attending to thier flooded or leaky buildings. We decided to stay another day as it forecasted more rain today and tonight. So far it has not rained again today, but we will see what the night brings. All in all we were pretty happy that we had not been camping in the middle of nowhere when the downpour occurred! So our journey in Mexico has been full of adventures so far... And the leisurely pace has actually been a bit of a welcome change after the race down the US coast, but we are anxious to continue along with healthy bodies and see some more of this beautiful peninsula!